Are you towing the line? If you passed your driving test after January 1st 1997 you may require an additional driving test in order to tow. 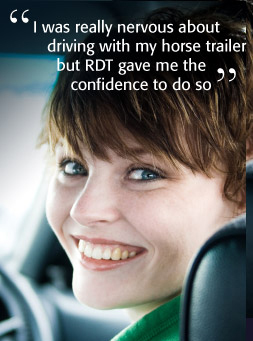 RDT are leading specialists in category B+E Trailer Test preparation Courses and operate across South Wales. Specialist tuition for towing: Box Trailers, Horse Boxes, Flat Beds, Boat Trailers, Caravans and Agricultural Trailers. Standard driving lessons for provisional license holders are also available. RDT is operated by Steve Thomas, Denise Harris, & Lauren Cooke DVSA ADI’s who provide tuition in the Monmouth, Raglan, Usk and Abergavenny regions. For more information call us on 01600 740 277, see us on facebook or email us. or on the read more link below. The New Driving Test - December 4th 2017. As widely reported in the national press and media, the Practical Car test is changing on Dec 4th 2017. There will be no need to rush to take your test before it changes. During trials there was no significant change in the pass rate. If anything, it was slightly higher. We have this covered. Promise. There are 4 changes. 1.The use of a sat nav for the Independent Drive,with, 2, an increase in time from 10 to 20 minutes. 3. Asking one of the 'Show Me Questions' on the move. 4 .A change in the Manouvres. We will start teaching the new sylabus in plenty of time to clients whose test dates fall after Dec 3rd. Our instructors are listed in Read More.